Rascular is a software design company that creates manual and automated control applications for third-party, professional video technologies. We work across the broadcast, streaming and A/V sectors. Bespoke or off-the-shelf, our applications work across SDI and IP technologies, providing template-based or user-defined panels that allow access to any and all functionality required, giving users the precision control they need, even in extremis. 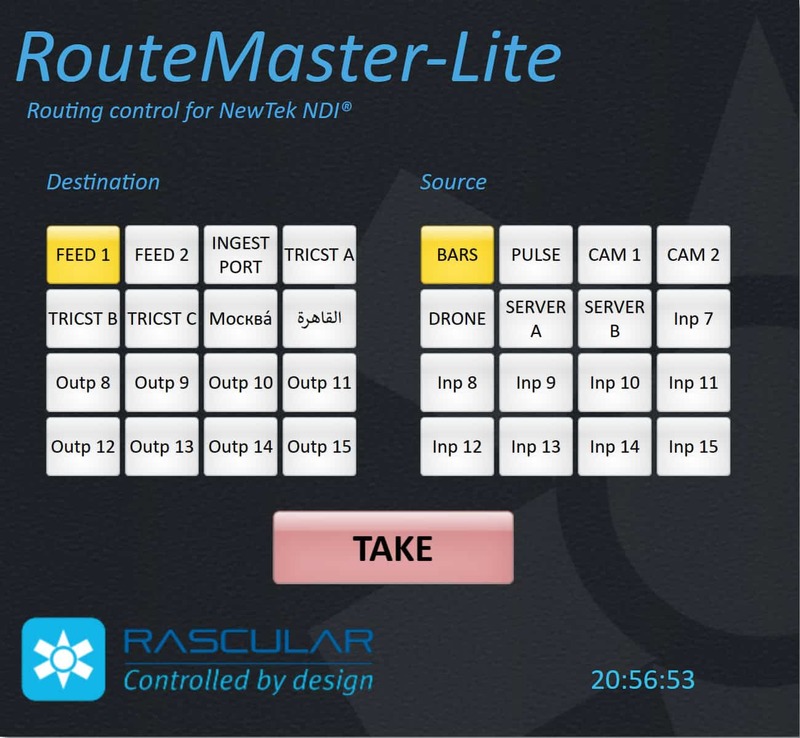 Recognising its importance to the future of compressed video transport, Rascular has embraced NewTek’s increasingly popular NDI video-over-IP protocol with the recent launch of RouteMaster-Lite. This is a standalone, PC-based, single licence application, based on Rascular’s powerful RouteMaster technology and is designed to provide comprehensive router control for NDI sources up to maximum 20×20 router size. RouteMaster integrates Rascular’s router control and emulation technology to form a powerful yet flexible router control system. Built on tried and tested software modules, RouteMaster can be used with a wide range of broadcast video and audio routers – past, present and future, SDI and SDI/IP hybrid – from the major router manufacturers. It also provides control of NDI sources. It’s equally suitable for new router installations or increasing the capabilities – and lifetime – of existing systems. RouteMaster also now includes tie-line capabilities, allowing the easy integration of NDI virtual routing in an SDI facility. ClockWork is a simple-to-use, standalone PC-based application that provides both automated time-of-day and full manual video and audio router control. In the SDI domain, it works with video and audio routers from all leading manufacturers. The combination of ClockWork and RouteMaster or RouteMaster-Lite also provides simple time-of-day automated routing of NDI streams. Because ClockWork supports Rascular’s RouteMaster native websocket-based protocol, ClockWork users can use the full power of RouteMaster-Lite to route signals in the NDI domain up to 20×20 router size. With RouteMaster, it’s up to a maximum of 64×64. Rascular is highlighting its ability to provide direct control of streaming content to dominant social media platform Facebook Live using its flagship control technology Helm. This can be achieved via Helm on a PC or via associated, device-independent web panels.